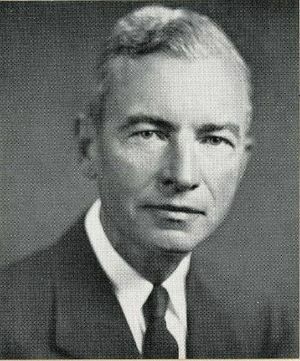 Donald A. Quarles, AIEE President, 1952 - 1953, was vice president of Bell Telephone Laboratories. In 1954, President Eisenhower appointed him as a member of the National Advisory Committee for Aeronautics. Quarles was AIEE president from 1952 to 1953. Donald A. Quarles was given an interim appointment as Secretary of the Air Force by President Eisenhower on August 11, 1955 and sworn into office on August 15, 1955. Since September 1, 1953, Mr. Quarles has been Assistant Secretary of Defense (Research and Development). Mr. Quarles was born in Van Buren, Arkansas, July 30, 1894. After completing high school there he enrolled in the University of Missouri Summer School at Columbia in 1910, 1911, and 1912, teaching mathematics in the Van Buren High School during the intervening seasons. Entering Yale University in 1912, he was graduated with a Bachelor of Arts degree in 1916. He enlisted in the Army in May 1917, served two years in France and Germany, and was discharged with the rank of captain in field artillery. Employed as an engineer by the Western Electric Company during 1920 and 1921, Mr. Quarles studied theoretical physics as a part-time student at Columbia. Joining the Inspection Engineering Department of Western Electric 1924 (which became the Bell Telephone Laboratories the following year), four years later he was in the Outside Plant Development Department, being placed in charge of this Department the following year. From 1940 to 1944 Mr. Quarles was Director of the Transmission Development Department, which concenterated on military electronnic systems, particularly radar, of Bell Telephone Laboratories. He was then appointed Director of Apparatus Development, and in 1946 also became a member of the newly-established Committee on Electronics of the Joint Research and Development Board, Department of Defense, and in 1949 he was named Chairman of that committee. Meanwhile, in 1948 Mr. Quarles was designated Vice President of Bell Telephone Laboratories. He was made Vice President of Western Electric and President of Sandia Corporation, a Western Electric subsidiary which operates the Sandia Laboratory in Albequerque, New Mexico, for the Atomic Energy Commission, on March 1, 1952. On September 1, 1953 he was appointed Assistant Secretary of Defense (Research and Development). Selected jointly by the Secretaries of Defense and Commerce to be the first Chairman of the reorganized Air Navigation Development Board in January 1954, two months later the President appointed Mr. Quarles a member of the National Advisory Committee for Aeronautics. Mr. and Mrs. Quarles, who consider Englewood, New Jersey, as their home community, now reside at 3041 Porter Street, N.W., Washington, D.C. By a former marriage Mr. Quarles has two daughters and a son, Carolyn Anne, Mrs. Stanley Lewis, and Donald Aubrey, Jr. Mrs. Quarles has a daughter, Mrs. E.F. Dressner, by a former marriage. Active in civic affairs in Englewood, Mr. Quarles has served as a member and then president of the Common Council from 1940 to 1946, and as mayor from 1946 to 1948. In recognition of his achievement in the engineering field, Mr. Quarles was awarded the honorary degree of Doctor of Engineering by the University of Arkansas on June 6, 1953, and a similar honorary degree by New York University on May 7, 1955. Mr. Quarles is a member of Phi Beta Kappa, Sigma. Xi the American Association for the Advancement of Science, the Yale Engineering Association and the Telephone Pioneers of America, and is a fellow of the American Physical Society, the Institute of Radio Engineers and the American Institute of Electrical Engineers. He served a number of years as a director of the latter institute and as its president from August 1952 until August 1953. Among Mr. Quarles' published papers are: A New Type Of Underground Telephone Wire, Bell System Technical Journal, July 1936; Motion of Telephone Wires in Wind, - Bell System Technical Journal, April 19.30; and Radar Systems Considerations, Electrical Engineering, April 1946. This page was last edited on 21 January 2016, at 17:36.